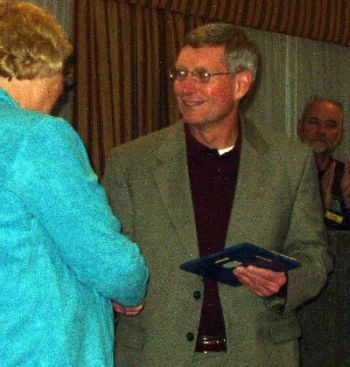 On Thursday April 19 Ron Enger, representing Southern Oregon Education Service District, was awarded the 2007 Herb Braselman Award by the National Association of Media and Technology Centers (NAMTC). This award is given in recognition of exemplary service and leadership for regional media/technology centers and for outstanding contributions to the field of educational media and technology. Ron has provided exceptional leadership during his two terms as president of NAMTC. Known as a strong contributor to the Media and Technology profession, Ron is well respected by his peers. He regularly communicates with colleagues across the nation to gather and share best practices in digital conversation, purchasing budgets and policies to insure that his Oregon districts have the best media and technology programs available. Ron has served many as a mentor within the administrative media and technology arena. He has a national reputation that reflects quality in what he does and a classic sense of good judgment. His positive attitude and willingness to work on the big issues facing schools is recognized and appreciated. Throughout his career Ron has been a known decision-maker who listens thoughtfully and exudes integrity. His NAMTC associates characterize him as a “gentleman who cares deeply about quality, service and products.” He personifies the exemplary service and leadership attributes required for the recipient of the Braselman Award.